Movescount is Suunto’s native mobile app and an exercise silo that can connect to Strava to automatically cross-post exercise posts there. 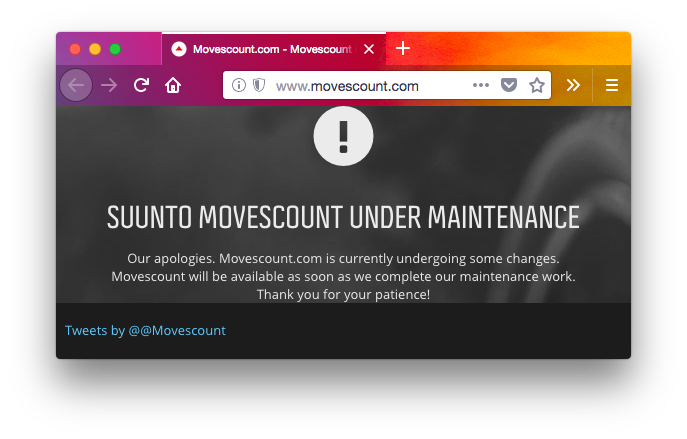 We are currently having an issue with move sync to Movescount. Our team is working on fixing it as soon as possible - apologies for the inconvenience. Movescount remains under maintenance as we work through the process of fixing the sync-related issues. We apologize that this is taking longer than initially anticipated. We will share more as soon as we are able. 2018-02-05 10:08 same message as of 12:53. Just add export from app to GPX. This page was last edited on 5 February 2018, at 14:32.